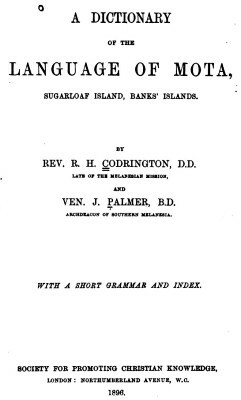 R. H. Codrington and V. J. Parker : Surf Riding at Mota, Banks' Islands, 1896.
with a short grammar and index. Society for Promoting Christian Knowledge, London 1896. The abbreviations and locations have been completed from the Preface notes. 1891 Robert Henry Codrington : Surfboards in the Banks and Torres Islands. Extracts from The Melanesians : Studies in their Anthropology and Folklore, Clarendon Press, Oxford, 1891. The language of Mota is spoken as their native tongue by some eight hundred people, and has never probably been spoken in a past generation by more than a thousand. medium of communication in the Melanesian Mission. Mota, Sugarloaf I., is one of the Banks' Group, which lies to the north of the New Hebrides. The Mota language is closely connected with the other languages and dialects of the Banks' Islands, and of the northernmost islands of the New Hebrides. These belong to a well-defined group of Melanesian languages ; and these again are members of the great family of Oceanic Languages spoken throughout the island world, which stretches from the coasts of Africa and Asia to the most Eastern groups of Polynesia. The examples which are given with some words are almost all written or dictated by natives. A keen interest was taken by those with whom the vocabulary was last revised, and their help has been much missed in the compilation of the Dictionary in England. Asuasu, said of a canoe running swiftly, o aka we asuasu sage salilina, runs up ashore in smoking surf. Lan, ... 3. ... Fl. [Florida, Solomon Islands] lani gabu, the iris on surf or rainbow, rain of blood. Lelenawo, V. [a word of Veverau] to swim on the surf-board. Lin, 1. to incline, lean. lin sur natapana, met. has come safe through, has inclined his surf-board to the shore. Magovagova, bending, giving ; as the side of a boat when struck by surf ; elastic. Nawo, salt-water, salt ; surf ; v. [verb] ... nawo nun, surf coming in long line, ti malate vagaegae. Ninroa, [mn 2.] smooth, glassy, like surface of calm water. Nore, to make a noise ; nore goro, disturb by noise, norenore, noise, as of surf. Nun, to make a resounding noise as thunder, surf. Olo, 2. to come ashore, as of a canoe, its bow turning upwards to the beach. ololovag, M. [a word of Maligo] to come through surf on the tapa, surf-board. oronawo, light stuff carried up by the surf; oropei, rubbish carried by water. Qoriag, (qor) to whirl about, as surf ; qoriag risris, whirl and turn over and over. Sao, 1. n. [noun] a place on the shore without breaking surf, a landing-place for canoes ; tursao wesao, salava. met. [metaphorical] ni me lin sur natapana, he has brought his surf-board down over the breakers, he is safe. Tuaqata, to crush, come smashing, crashing on ; as falling bread-fruit smashes, thunder or heavy surf crashes. Tuketuke-nua, surf leaping up when the reflex wave meets an incoming wave ; said to be tiketike nua. Tul, 5. v. [verb] same as tila M. [a word of Maligo] to accuse, lay blame ; ni me tul goro ape nawo, he laid the blame on the surf. Turerea, the surf rushing back, as in a masasa; o matesale rere. Tursao, [tur 3.] good, principal, landing-place, sao 1., were there is no surf. Uto, 1. to come above the surface in water. Vaqirqir, [va. 3.] to crowd together, qir, confusedly; o nawo we malate vaqirqir, surf breaks irregularly. Geoff Cater (2013) : R. H. Codrington and J. Parker : Surf Riding at Mota, Banks' Islands, 1896.